The cost of a night out in Dublin is €81. The cost of a night out in the capital is now €81 on average - with more than half of that going on alcohol. A further 23pc is spent on food, with other significant expenses including taxis (13pc) and babysitters (7pc) as well as the cost for nightclub entry. The report was published by the Licensed Vintners Association (LVA), which represents publicans in Dublin, and it is the first survey of its kind. It also looked at some of the common behaviours witnessed on a night out in the capital - and whether they are deemed acceptable. Six out of every 10 punters believe using Facebook while in a pub is "anti-social", but 60pc said it was important for a good pub to have Wi-Fi. 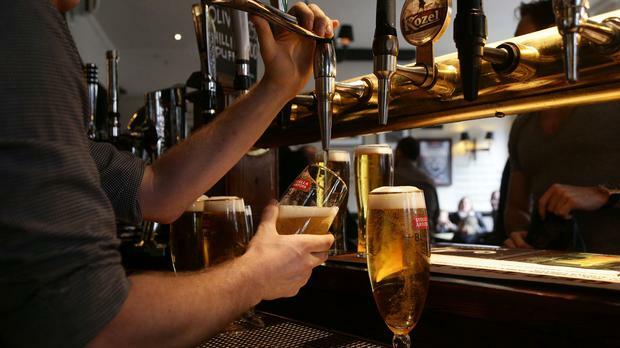 CEO of the LVA Donall O'Keefe said the amount of trade in pubs nationally is down 35pc since the peak in 2007. He blamed three successive years of tax increases imposed by the Government, adding to the cost of a drink each time. Certainly the majority of the spend on a night out now goes on alcohol. The survey, which canvassed opinions of 550 people, showed 52pc of money shelled out during a night in the pub goes towards buying drink. He said the issue isn't a simple case of yes or not to social media while on a night out. "Even if people are not on Facebook or Snapchat or betting websites all the time, it's clear that having access to them for a range of devices is really important," he said. Having a TV switched on in the pub is a controversial topic for Dublin pub goers. Almost one in five (19pc) said a TV should never be on in a pub- a quarter of women don't want the TV on, in comparison to just 13pc of men. When it comes to showing sport, nearly half of men (47pc) believe the TV should only be switched on for a sporting event, whereas only 29pc of women agreed. Mr O'Keefe noted that 38pc of women don't care whether or not sport is shown in the pub they are drinking in. "The figures suggest that for iconic matches like Ireland in the Six Nations Rugby Championship final, everyone wants to watch it. But for your run-of-the-mill Premiership matches, women don't care about these," he said. More than a third of respondents (37pc) would like to own their own pub, the majority of these again being male. Younger people (18-34) accounted for 54pc of the pub owner hopefuls. When asked what pubs could do to attract more customers, the majority of people said that reducing prices would bring in more publicans.